Following arrests of its seven officials in Sweden, FIFA assured at a press conference that the 2018 and 2022 WC games will still be held in Russia and Qatar. Calling itself “the damaged party”, the federation said it fully cooperates with the probe. A press conference was called over the scandalous arrests of FIFA’s top shots on corruption charges. The body called it “a difficult… but good” moment that warrants a much needed cleanup. Sepp Blatter, however, will not be stepping down as president, as he is “not involved” in the scandal. Friday will see a FIFA’s annual meeting and an election, where Blatter is expected to win for the fifth time. The probe has also cast a shade on the 2010 vote which decided on the 2018 and 2022 World Cup tournaments. The Swiss Attorney General (OAG) alleges 'criminal mismanagement and money laundering' took place during the procedures. De Gregorio also reminded that it was FIFA who on November 18 of last year filed criminal charges with the OAG, and it is therefore the football body that is the real “victim” here in the fight against corruption. Early Wednesday morning, Swiss authorities raided a luxury Zurich hotel, arresting seven top FIFA and related officials. OAG says electronic and other information and documents have also been seized from the federation’s headquarters as part of the investigation. One of the most significant arrests is that of Jeffrey Webb, the vice president of the executive committee. Webb has previously been hailed by Blatter as a potential successor. Other officials held by Swiss police include Rafael Esquivel, President of the Venezuelan Football Federation, Eduardio Li, President of the Costa Rica Football Association, Jose Maria Marin, vice-president of the Brazil Football Federation and Jose Maria Marin, vice-president of the Brazil Football Federation. A total of 14 officials and sports-marketing executives were charged in an indictment containing 47 counts. Seven of the defendants were arrested this morning. They are now be facing extradition to the US. Two FIFA vice-presidents are also involved in the corruption scandal, as well as the South American confederation, CONMEBOL, and the US Soccer Federation, CONCACAF, which are part of the six continental confederations recognized by FIFA. The unexpected arrests were carried out by Swiss authorities as part of a top-level US investigation. On top of the OAG probe, the FBI will be looking into bribes 'totaling more than $150m' linked to commercial deals dating back to the 1990s for football tournaments in the United States and Latin America. Fourteen people have been charged by the DoJ, including nine FIFA officials. Five of the charged individuals pleaded guilty under the seal in the period from July 2013 to mid-May of this year. The Miami headquarters of CONCACAF, a football federation that governs North America, Central America and the Caribbean, has also been searched, the DoJ said. 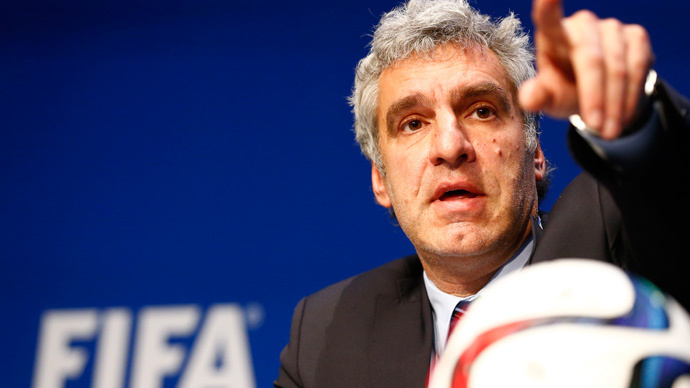 The US is seeking to extradite nine FIFA officials indicted for conspiracy and corruption. The Swiss justice says six of those arrested oppose extradition.